In my last blog post, I shared my love of tea and my success in finding a U.S.-grown product. 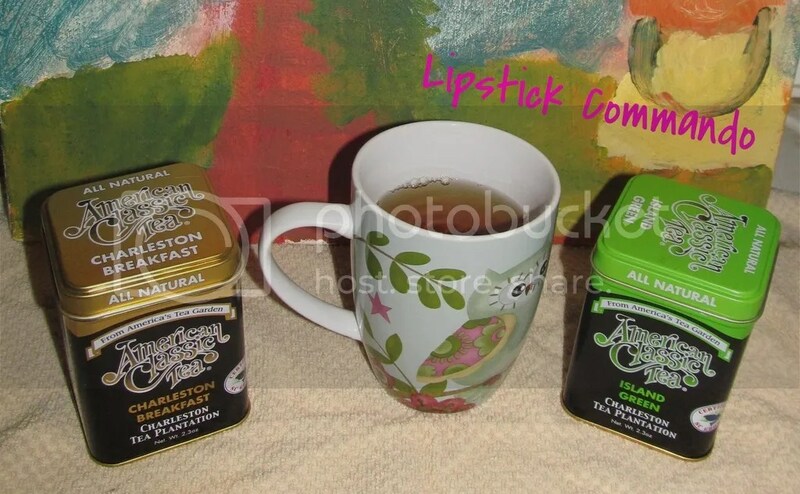 I ordered Island Green and Breakfast Blend (black) from the American Classic Tea line produced by the Charleston Tea Plantation in Charleston, South Carolina. They offer a number of bagged teas, as well as the loose leaf teas from which I chose. I’ve been drinking them for several days now, and am ready to offer my opinions. First, a look at the packaging. The teas arrived in tins that are attractive, space-saving, stack-able and utilitarian. Tea aficionados know that tea should be stored in opaque containers away from moisture, and these metal tins do the job nicely. I look forward to using them for years to come. The package itself was shipped with a return address label from Bigelow. Okay, if I had done a more thorough examination of the web site, I would have seen that Bigelow bought the plantation in 2003. I’d prefer it still be a family-owned business, but at least the tea is U.S. grown using no pesticides of any kind. The tea leaves themselves smell fresh, just as they should. The green tea leaves are a delightful green color, as well. So far, so good. I made tea using my enamel tea pot with stainless steel infuser. A couple of times, I added some organic peppermint leaves to my tea when I wanted a change of flavor–one of the advantages of ordering an unflavored teas. I must say, I have not had a bad cup of tea out of these yet; even when I forgot and left some black tea steeping about two hours, the tea was, well, drinkable, although it was certainly not fresh at that point. The tea has no bitterness, as older, poorer quality teas often do, so no sweetener is needed unless you simply prefer it. When made properly (not forgotten in the teapot) with water at the correct temperature, both teas go down smooth and soothing. If you are looking for a stronger tea flavor, use more tea leaves. The one odd thing is that the tea leaves are not whole. Instead, they are small, broken tea leaf pieces. Perhaps it was naive to expect whole leaves, but since the only other products offered in their online store are tea bags–which conventionally contain dust-sized particles of tea leaves–I have to wonder what they are doing with the whole leaves they harvest. At first I thought they might sell them to other companies or use them in a tea marketed under another brand; but, according to their FAQ page, quite a lot of people have had the same question, and the answer is direct: “No, American Classic Teas are the only teas made from the green leaf produced by the Camellia Sinensis plants grown on the grounds of the Charleston Tea Plantation.” Their web site does say they offer “First Flush” tea at festivals (or “Festeavals”), so perhaps the whole leaves go into tea used for such occasions. Regardless, the bottom line is that both varieties I bought taste good and, to my mind, make satisfactory cup after cup of tea. The price is comparable to other, plain loose teas from specialty stores. The clear advantage these teas have over their competitors is you know where the tea was grown, harvested and packaged, and the methods they use for doing so. If you’re looking for a decent cup of tea you can trust, from heirloom trees grown in the U.S. without pesticides, American Classic Tea from Charleston Tea Plantation will certainly meet your needs. Over the last couple of years, I’ve become more conscious of what I put into my body. And one of the things I have grown to love is tea. Tea is almost magic–when made properly and with good quality ingredients, it tastes good, all by itself. It has zero calories, zero fats, zero carbs. As with many wholesome foods, no sugar is needed, not even for an American palate. I’ve been trying a number of organic and fair trade teas lately, and I’ve begun to pay more attention to where they are grown. I have my own concerns about the safety of products from various overseas countries. But, recently, a friend of mine made my love of tea much more complicated by sending me a link to an article that discusses this very thing–concern over various pesticides and chemicals used not only in tea but in the paper used for tea bags. Now, it’s just an article someone posted on the Internet, so I know enough to take it with a grain of salt. But it did get me thinking, and I wondered if I could find any U.S.-grown tea. Shopping local is not likely to happen for me, being in the south central part of the country, with nary a tea tree in sight. But I did just a little research and found Charleston Tea Plantation in Charleston, South Carolina. According to their web site, they use no pesticides, which they define as including “herbicides, fungicides and insecticides.” Sign me up! They have six varieties of loose tea: Breakfast Blend, Peach, Governor Gray, Rockville Raspberry, Island Green Mint and Island Green. They also have nine varieties available in pyramid-shaped bags, and a small line of body products available. Their products are available in dozens of stores across the United States, but since none of them are close to me, I ordered the Breakfast Blend and the Island Green loose teas online from their web site. I can’t wait to try them!